How a lunar eclipse works. Eclipses of the sun and moonusually come in pairs. A solar eclipse is almost always accompanied by a lunareclipse two weeks before or after it, since in two weeks the moon travelshalfway around its orbit and is likely to form another almost-straight linewith the Earth and sun. This month will be no exception.Just over two weeks after casting its shadow across the Arctic, Russia, Mongolia and China, themoon will swing around to slide deep through the northern edge of theEarth's own shadow on the night of Aug. 16-17. This partial lunareclipse will favor much of Europe, Africa and Asia. The moon will passthrough the northern part of the Earth's dark umbral shadow between 3:36 p.m.and 6:44 p.m. EDT (19:36 and 22:44 GMT) on Aug. 16. 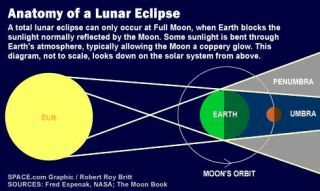 At greatest eclipse (5:11 p.m. EDT or 21:11 GMT), 80.8percent of the moon's diameter will be inside the shadow, leaving only themoon's upper portion still in view. Except for a brief glimpse just after moonrise from eastern Newfoundland, this partial eclipse will not be visible from anywhere else in North America. The eclipseofficially will begin with the moon's entry into the Earth's faint penumbralshadow. The penumbra does not begin to make itself evident on the moon'sdisk until about 70 percent of its diameter is immersed within it. Not until about 3:10 p.m.EDT (19:10 GMT) is the first faint diffuse shading likely to be seen on themoon's eastern (left) side. This is before dawn on Aug. 17 in west-central Russia and western sections of Mongolia and China; early risers in these locations may glimpse thedelicate penumbral effect just prior to when the moon sets and the sun rises.By the time the moon begins to enter the much darker/sharper umbra, the sun hasrisen over central China, most of Southeast Asia and central Indonesia. The Earth's umbra will be seen to touch the moon at 7:36p.m. British Summer Time on Aug. 16 in London; 10:36 p.m. local daylight timefor Moscow; 12:06 a.m. local time on Aug. 17 for Kabul, and will continue tocreep down over its face for more than an hour and a half. The rest of Europe and the countries of central and western Africa see the same thing but earlier in their night and with the umbra creeping up, asit is coming from the south. Some hues of dull brownish-red may become evidenton the eclipsed portion of the moon's disk around the time of greatest eclipse,but after going just over four-fifths of the way across the moon's face, theumbra retreats, and just over an hour and half later it's gone. And by 5:10p.m. EDT (23:10 GMT), the last evidence of any faint penumbral shading alsodisappears. And at each successive full moon for the balance of the yearit manages to sail clear over to the north of the Earth's shadow, so there areno other lunar eclipses in 2008. The next lunareclipse will be strictly a penumbral event and will occur on Feb. 9 of nextyear and will favor Alaska, Hawaii, eastern and central Asia, Australia and New Zealand. But the next total lunar eclipsewill not come until Dec. 21, 2010.